Guatemala is a traveler's favorite and with good reason: colorful markets, a plethora of traditional highland villages, and bargain prices. For cyclists, Guatemala's Highlands mean tough climbs and lots of them. The lowlands are sweltering hot which is another type of challenge for those biking through Central America. In spite of all those thigh-burning climbs, biking throuhg Guatemala's Highlands is well worth the effort. The scenery is stunning and you'll be hard pressed to find more picturesque villages or lively markets any where else in Central America. Roads through the highlands tend to be pretty quiet, so you can enjoy the ride without worrying about being flattened by an overloaded truck blazing down the road. Major roads through the lowland towns tend to be very busy, with heavy traffic--mostly trucks and buses. Overall, roads are fairly well maintained and drivers have a decent amount of road sense. We used Reise Know-How's detailed Belize-Guatemala map. You won't bike for long in Guatemala without running into a town with a hotel. Guatemala is not an ideal country for camping since it's quite heavily settled. If you're in a bind, you can always ask the local shopkeeper for advice. 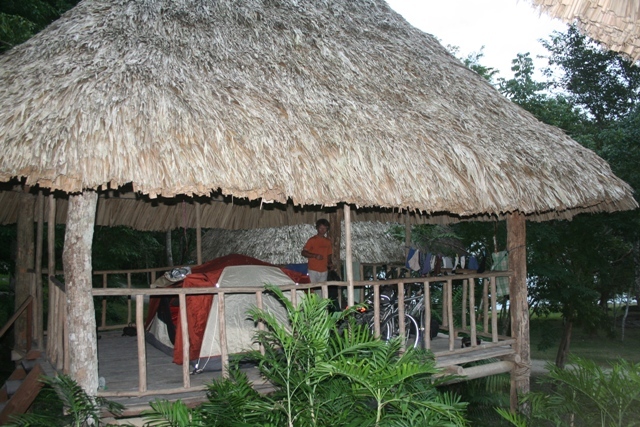 A great camping spot not to miss is at the Yaxha ruins near the Belize border. You can camp high up on a platfrom overlooking the lake. Cold showers and ultra clean toilet facilities are available and the cost of camping is included in the entry price to the ruins. Plus there's no limit on how long you can stay, just be sure to pack lots of provisions because its a bumpy ride out to the the campsite. Bike touring in Guatemala is downright cheap. We spent around $8 per person per day, often staying in hotels, having breakfast in restaurants and self-catering most other meals. In backpacker meccas such as San Pedro on Lake Atitlan you can get a comfortable, clean room for as little as $5. It pays to check out several hotels because quality varies enormously. Filthy places with cramped rooms will charge just as much as the spotlessly clean hotel three doors down. Bizarre. Annoyingly, room prices are usually calculated on a per person basis, so sharing a room doesn't cut costs. Restaurants are also a bargain, a basic breakfast costing around $1.50, lunch and dinner at a local restaurant will cost around $3. Any advice or questions about Biking in the Guatemala?